This odd-looking guitar came to me at the right price so I couldn’t pass up the chance to own, play, and write about the seemingly not very popular Guild M-80-CS. This example is from 1975, and is in pretty darn good condition for an almost 40-year-old guitar. Let’s take a close-up look at this 1970s Guild and see if they’re worth buying should you happen across one in your travels. 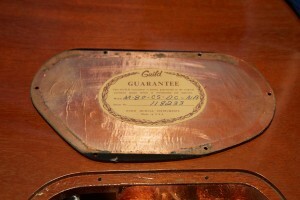 Spoiler: the answer to that last question is almost always yes when it comes to vintage Guild electric guitars. 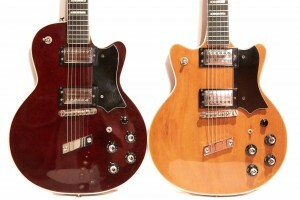 The Guild M-80 CS is kind of like a double-cut M-75-CS of the same era. In fact, if you look at the M-75 CS to the right and compare it with the M-80 CS pictured, it’s really looks to be a very similar guitar. Note that while they’re both CS (chrome solidbody) models, I’m going to just refer to them as M-75 and M-80 because by the time these were released, Guild had done away with the hollow versions. The obvious difference between the two is that the M-75 is a single-cut and the M-80 is a double cut. 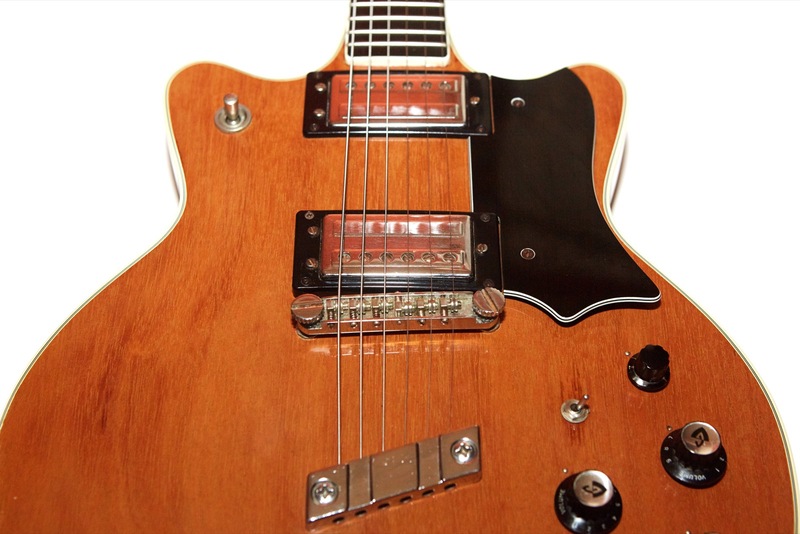 Another difference that’s tied to the loss of the upper bout is the movement of the pickup selector switch which is directly over the neck pickup on the M-80. Also, since there is no upper bout on which to mount the strap peg, the strap peg is on the back of the neck like it is on a Guild S-100 or Gibson SG. The pickups are the same distance apart on both, and the neck is practically the same on both as well, but they mount a bit differently due to the bodies being different thicknesses (see the Fretboard and Neck section for details). The M-80 is kind of a double cutaway M75, but it’s not, really. They feel very different in the hand for a couple of reasons, the two main reasons being thickness and weight. The M-75 is 42mm thick at the lower strap peg while the M-80 is 50mm at the lower strap peg. This M75 weighs 8 pounds even while the M-80 is 3/4 of a pound heavier at 8 lbs 12 oz. 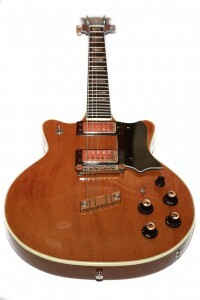 The M-80 was advertised as having a maple top, no doubt in an effort to grab Les Paul sales away from Gibson, while the M-75 is all mahogany. Thickness and weight differences are also compounded by the position of the upper strap peg which makes the two guitars feel very different while playing with a strap. And let’s not forget the ad from a few years later (now in color!) with the tailpiece closer to the bridge and guy concentrating way too hard on that A barre chord. Man, I miss the ads from the ’70s and ’80s. I suppose it’s partially because that’s when I gave up on guitar magazines, but that’s not important right now. This guitar’s model designation according to the sticker on the inside of the control cavity cover is M-80-CS-DC-NB which gets my vote for the longest model name ever. My best guess is that it’s an M-80-CS (chrome solid body) that’s a double-cut (DC) in nature boy (NB) finish. It’s kind of odd to me that they would denote DC in the model name since the M-80 is a sort of double-cut version of the M-74 and I’ve never seen an M-80 single cut, but Guild has done some wacky things over the years, so who am I to judge? The finish on every Guild electric I’ve played from the ’70s is lacquer, and this particular guitar is in fabulous shape for being over forty years old. The finish is very smooth and since the color is “nature boy”, the character of the wood shows through. 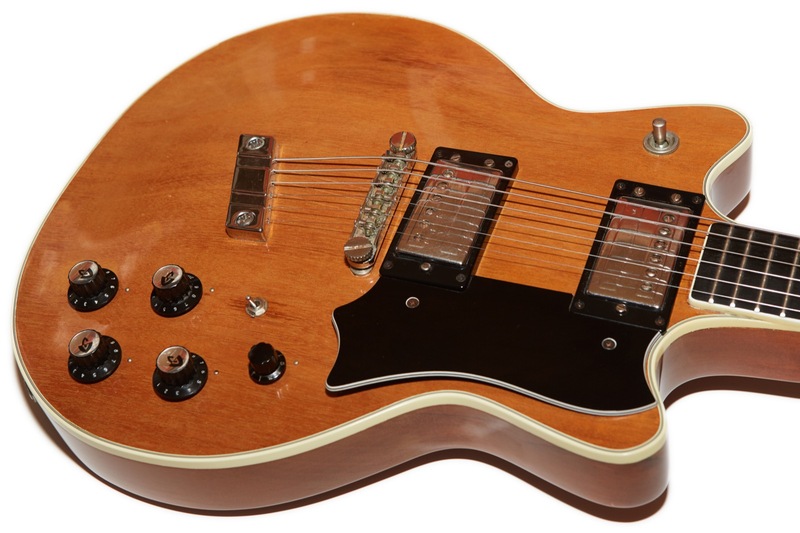 From a wood grain perspective, this guitar is very plain, but the guitar is really quite beautiful almost because it’s so plain, and in a world where extremely flamed Les Pauls are highly sought after this guitar is a refreshing change. There’s really not much else to say about the finish other than that it is supurb. Actually there is something that’s not quite finish related, but you can see it because of the finish. I believe this gutiar to have a one-piece top. 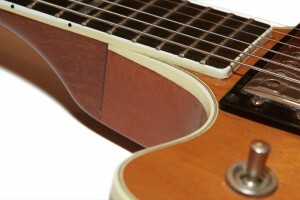 The body of the guitar also appears to be one piece. Does that really matter? Probably not, but I do think it’s cool. 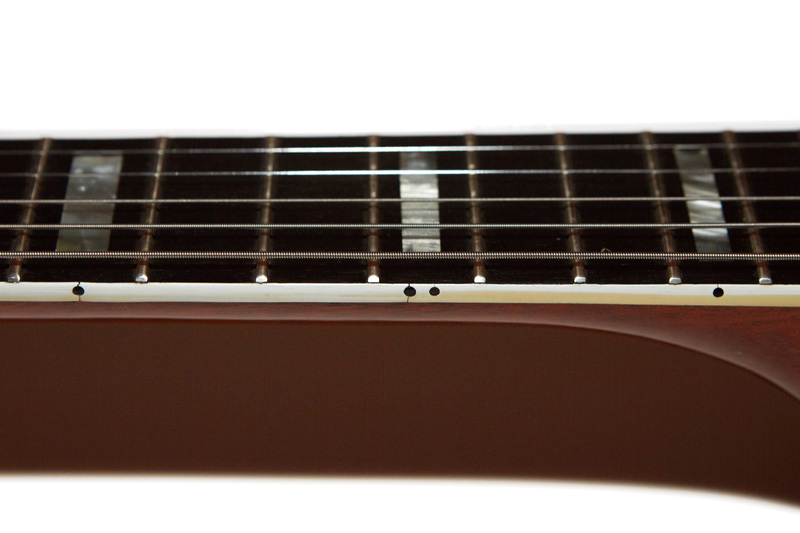 The fretboard at the nut measures 1 21/32″ which is halfway between 1 5/8″ and 1 11/32″. I’ve discovered that quite a few Guilds from the ’70s have the slightly wider than advertised necks and that extra 1/32″ makes a difference to me. While 1 5/8″ necks are too small for me, the 1 21/32″ necks feel almost right. I say “almost” because I greatly prefer a wider neck. The fretboard is ebony and the inlays are mother of pearl (MOP) blocks, or at least whatever synthetic they may have been using at the time. Honestly, whatever it is it looks great so there are no complaints from me if they’re not real MOP. The frets are in great shape, and are 1/32″ tall and 5/64″ wide. 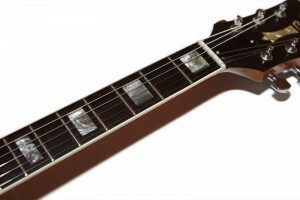 The fretboard radius appears to measure at 16″ and the fretboard has 22 frets. The frets are all very well finished and I don’t feel any snags, low spots, or rough spots of any kind. The neck on this guitar feels almost unnaturally long, similar to the way the neck feels on a Guild S-100 or Gibson SG, but with the body being thicker, I think it feels almost like the neck of an SG on the body of a Les Paul, although every SG I’ve ever played had a 1 11/16″ neck at the nut. The neck attachment on the M-80 is very different from the attachment on the M-75, likely due to the missing upper bout and the increased depth of the body on the double-cut M-80. Additionally, due to the increased depth of the M-80’s body, the fretboard sits more inline with the top which also means that the pickups sit closer to the body. 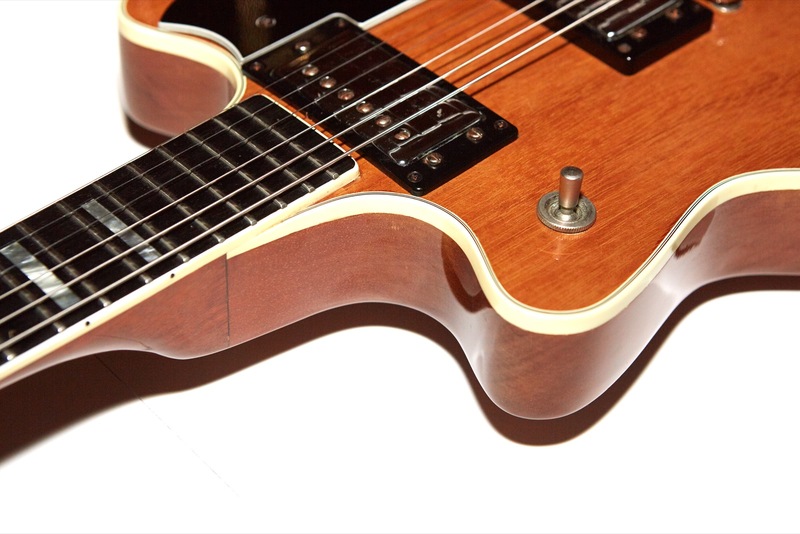 If you look at the two pictures to the right, you can be see not only the difference in the neck, but also the height of the neck pickup on the two guitars. This difference in neck attachment makes the M-80 feel more like a solidbody than the M-75 which, in comparison, feels a bit more like a Starfire due to the strings being farther from the top of the guitar. This is a subtle thing, and I didn’t even notice it until I had them side by side, so I wouldn’t let this prevent you from buying either of them. They both have arched tops, by the way. About the only thing I’m not crazy about on this guitar is the neck since it’s a tad on the small side, but for some reason I like it more than I do the M-75, probably because the M-75 has a neck that measures exactly 1 5/8″ at the nut while this one is a bit wider. Yes, 1/32″ does make a difference. The neck binding, however, is another matter which I cover in the next section. The build quality is superb, as it is on most US-made Guilds from the 1970s with one important caveat which is the binding. Vintage Guilds are known for sometimes having binding problems, and even though this guitar is in great shape overall the neck binding is a bit of a mess, though I’ve seen worse. The binding on the neck has multiple splits, all of which coincide with the fret markers. 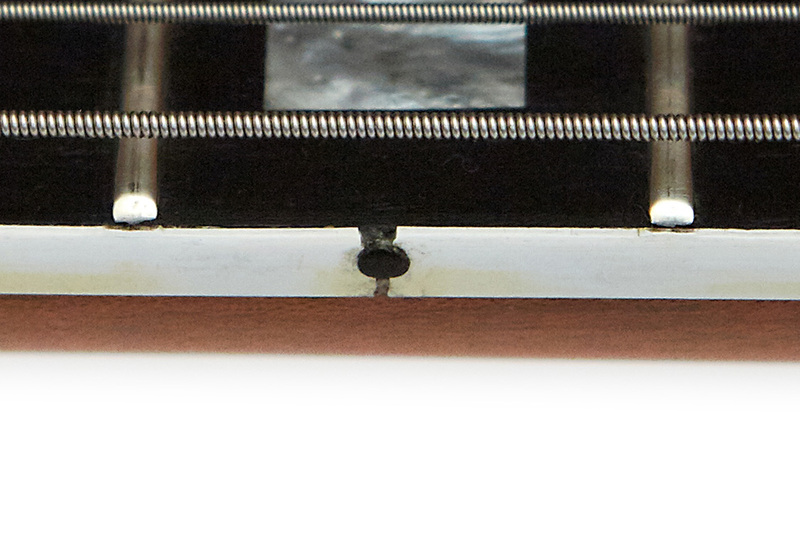 It seems as if the binding was installed and then the fret markers were actually drilled or nailed (or something) into the side of the fretboard through the binding, thus weakening the binding. 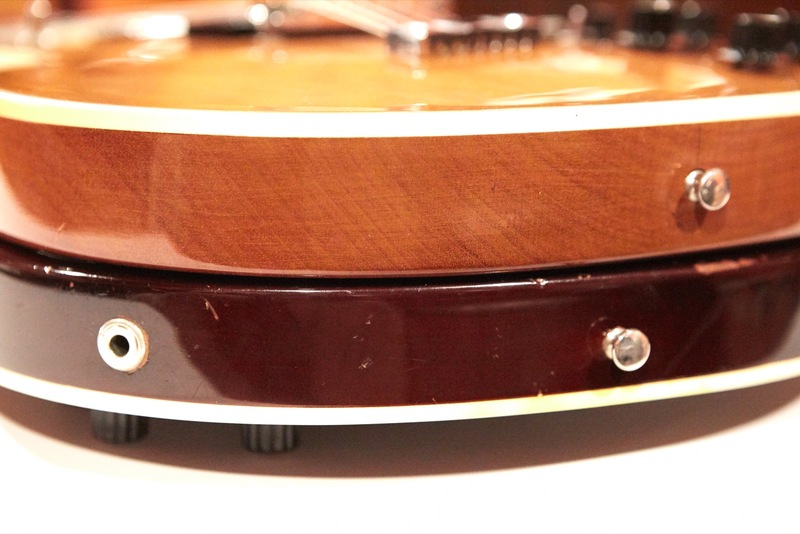 Over the years the binding shrank a bit and broke at the weakest points which is where those fret markers are. I suppose it’s possible that it was refretted and the person doing the work broke the binding, but given some of the binding rot I’ve seen on other Guilds and the overall condition of the guitar either the binding rotted or the guitar was completely refinished and refretted by a real pro… who left the broken binding. 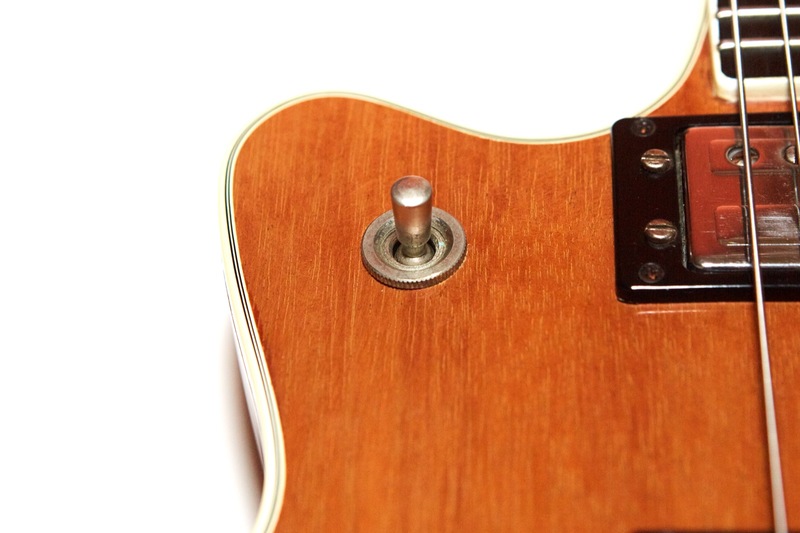 The fret markers are also of different sizes, and I don’t know if this is by design or is someone was just asleep at the binding station during the build process, but it really trips my attention-to-detail switch in unpleasant ways. 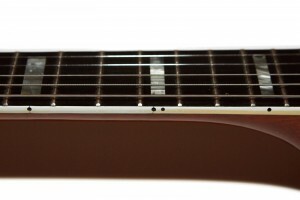 The dot on the first fret is larger than the rest and the double dots at the 12th fret are different sized from each other. I almost have to wonder is the binding was worked on by someone at some point in the guitar’s life and that person used the wrong sized fret markers when they did the work. I’d like to think that Guild didn’t do this sort of thing, but I’ve seen Guild do some pretty wacky things, so who knows. The side markers are an odd anomaly on an otherwise very well built guitar. I love bound fretboards, but binding problems like this can make me understand why many people don’t. Right now the problem is pretty much a non-issue while playing. I’ve seen some pretty nice Guilds from the ’70s with entire chunks of the binding missing completely. Luckily, this guitar is not one of them. At least not yet. The pickups are Guild HB-1s, typical of Guild electrics from the 1970s that weren’t ordered with optional Dimarzios. 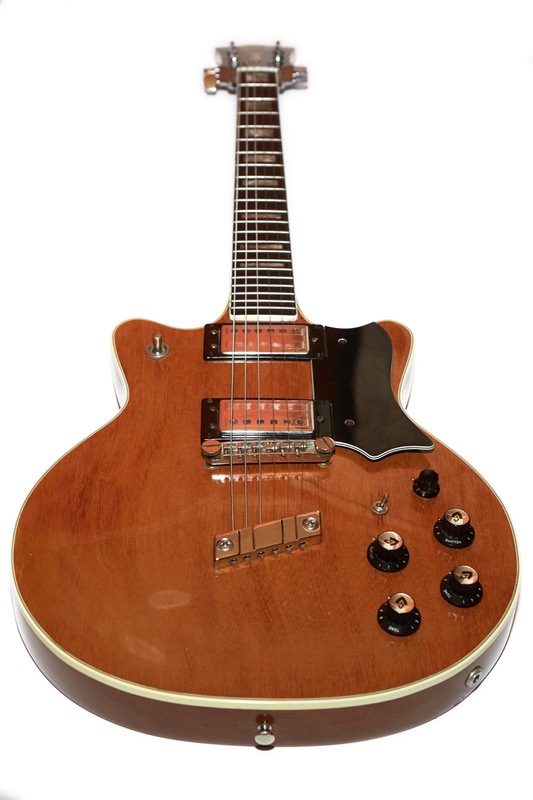 I’m a huge fan of HB-1s, and any guitar that has them is likely to be favored by me. 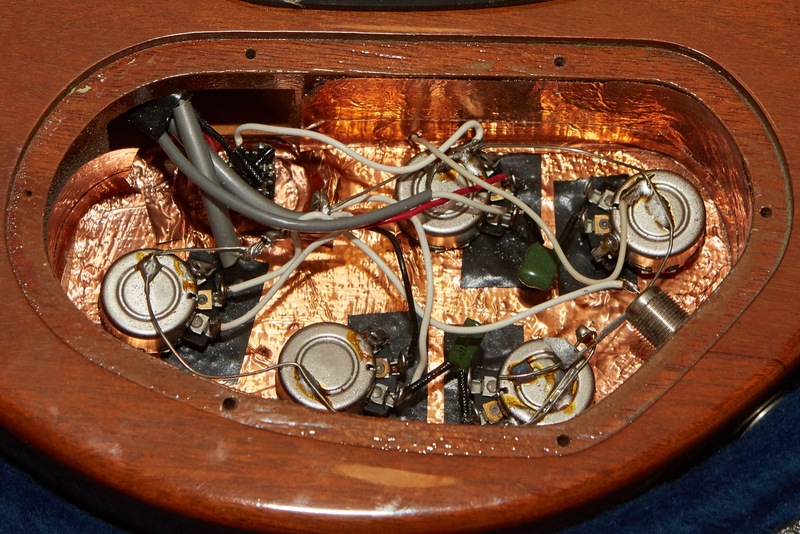 I did not pull these pickups because I generally don’t like to tear apart vintage instruments that are in this kind of fine shape, but I can all but guarantee that they measure along the lines of 7-7.2k Ω in the bridge and 6.9-7k Ω in the neck. I like HB-1s because they’re low-wind pickups that have a fair bit of chime to them while also being able to growl in a most satisfying way and this guitar is no exception. This guitar rocks hard while being able to ring when it needs to. The controls are pretty typical of a dual-humbucker guitar with the addition of a phase switch and a master volume. Though I would have preferred the master volume to be on the lower horn, the horns are almost nonexistant and so there is very little room for it there. If it were to be placed in the same relative position as the pickup selector toggle is on the top horn, then it would likely get in the way while playing. Plus, the pick guard is in the way up there. When I got the guitar, the pickup selector wouldn’t stay in the bridge position for long until it would pop out while playing. A bit of time with some needle nose pliers made it better, but the switch should probably be replaced. It likely won’t be, though, until it fails outright because I like to keep the parts original in a guitar that looks this good. The control cavity looks like a section of a Mars rover because it’s completely shielded with copper foil. This is actually pretty common in 1970’s Guilds, until they moved to a shielding paint later on. 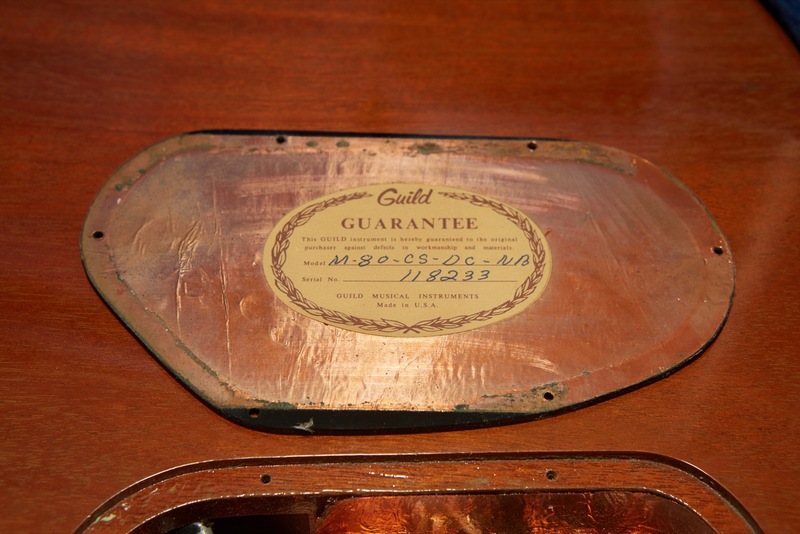 I think the shielding is a great touch as so many guitars back then would pick up all sorts of interference. 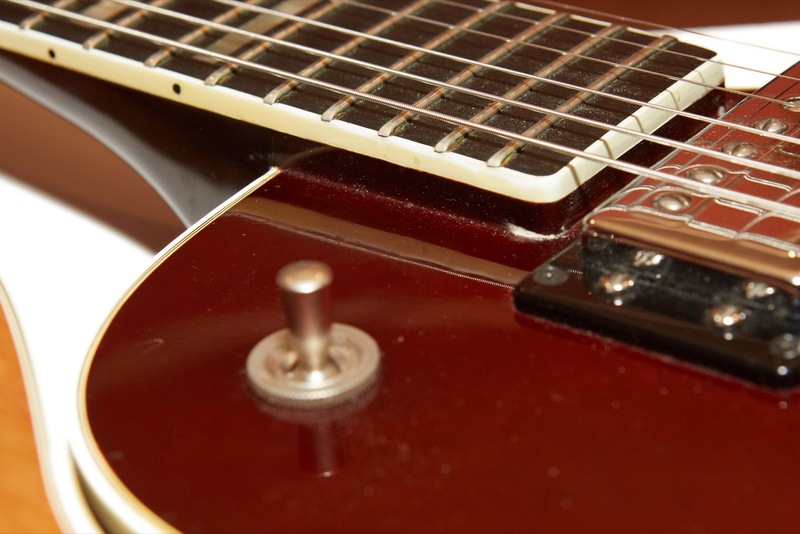 I once had a no-name guitar that would pick up CB radio transmissions, though that may have more to do with the fact that it was the ’70s and everyone was transmitting on CB radios than anything relating to the guitar. The hardware is all silver and likely chrome, though some parts look like nickel. I don’t really care what they’re coated with is so long as they work, and they do except for the previously mentioned pickup selector which has been repaired. The bridge is a mueller adjustable bridge common on 1970s Guild electric guitars, and the tailpiece is a similarly common angled block found on most Guild solid-bodies of the era. 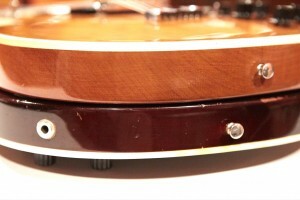 There are two basic designs employed by Guild regarding tailpiece position. 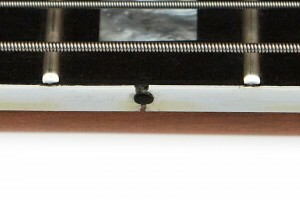 The first, as shown on this guitar, has the tailpiece far away from the bridge which causes an obtuse break angle for the strings going over the bridge. Other guitars, like my old S300A-D, have the tail piece much closer to the bridge which causes a much more severe break angle in an attempt to increase the downward pressure on the bridge. We argue constantly on the LetsTalkGuild forum about which one looks better, and many people just like the one with more distance because they can plink the strings behind the bridge. 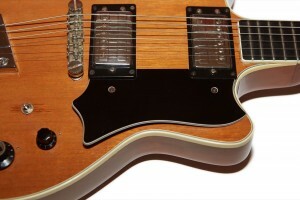 I think people prefer the tail piece arrangement that coincides with the first Guild electric they fell in love with. That’s certainly the case with me and why I prefer the look of the shorter arrangement. The tuners are Guild-emblazoned Schallers which are my favorite tuners, and they all work flawlessly. I like the large buttons on Schallers and for me they have always just worked. 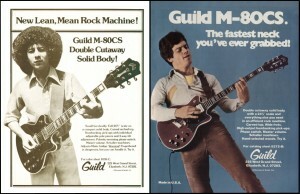 Guild calls these Guild Machine Heads in their ads, but I’ve always just assumed them to actually be Schallers. The forward strap peg is of a typical screw-in design and is on the back of the guitar similar to the ones found on Gibson SGs and Guild S-100s while the rear strap peg is a friction fit peg that is pounded into the body. My S300A-D had a similar lower peg and it was constantly falling out on me, though this one seems quite secure. I solved the S300’s issue by gluing in a properly tapered dowel and then drilling in a hole for a properly attached strap-lock. Again, I’ll do no such thing on this guitar unless it becomes a working guitar in which case strap-locks would be a necessity due to its weight. 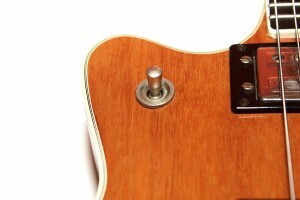 The pick guard is actually screwed right into the top with two rather large screws. The good news is that the pick guard does not lay on top of the pickup rings like it does on so many other ’70s era Guilds, so it’s not in my way and I don’t feel the need to take it off. Just looking at the picture bugs me, though, with those two big screw heads just sitting there screaming, “we’re screwed right into the top!” Thankfully, this guitar sounds so good that no I don’t care about the pick guard and its very large screws while playing it. 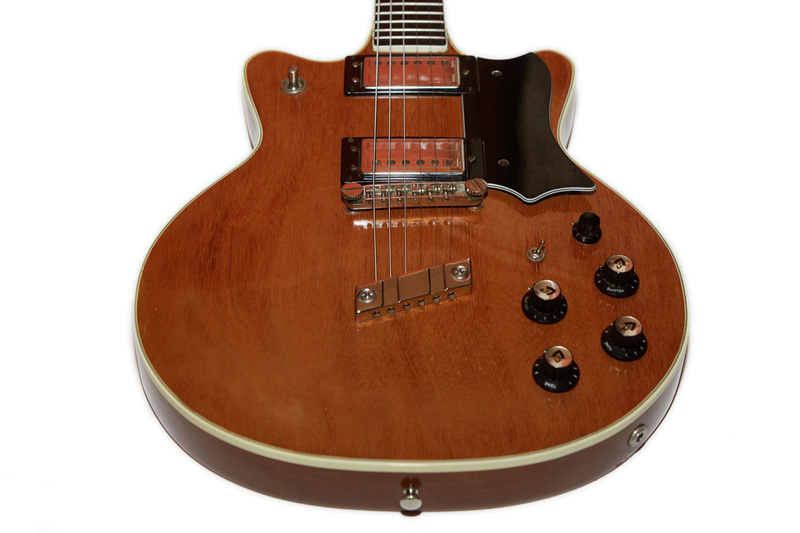 This guitar is a classic rock machine that delivers some very satisfying tones due to those low-wind Guild HB1s and the heavy Mahogany/Maple body. 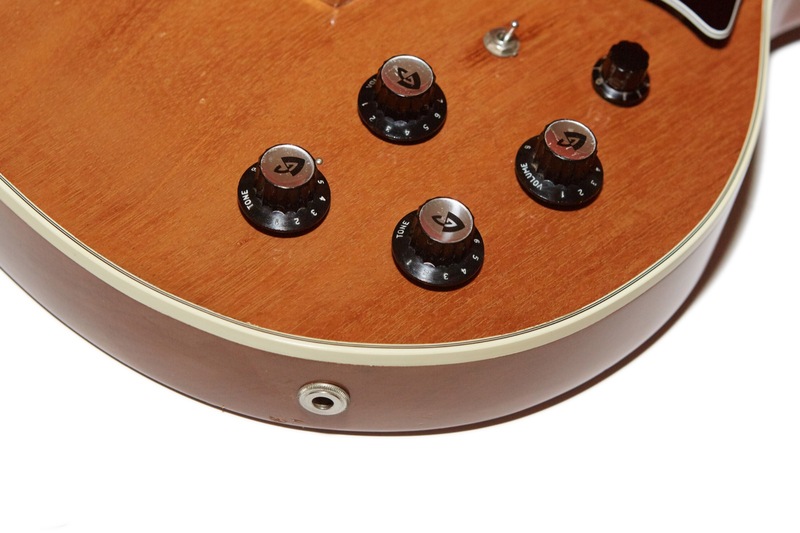 This guitars got some twang hidden away inside which can really be brought to life with judicious use of the phase switch and volume knobs. The neck pickup delivers some very sweet tones, especially in the upper registers, and believe me, you’ll want to play those upper registers because the entire neck is practically there for your weedle-weedle soloing abuse. There’s an old saying that “there’s no money above the fifth fret.” Well, whoever designed this guitar clearly thought otherwise. 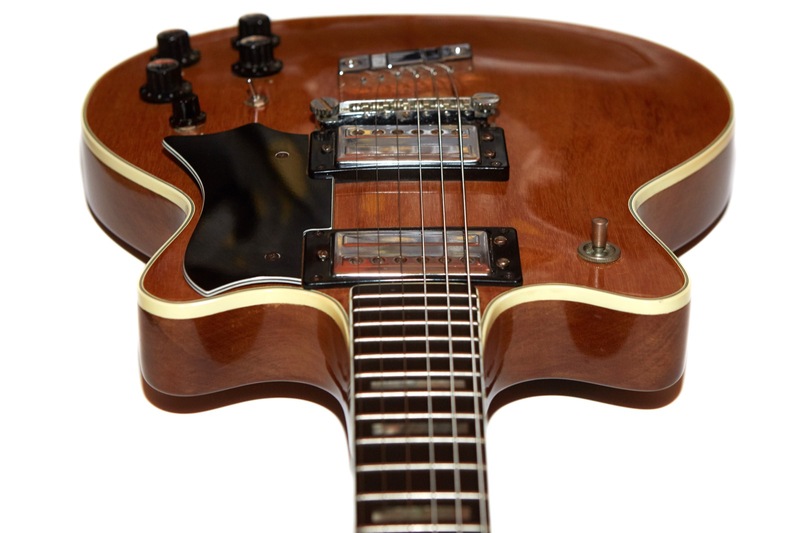 Just look at that upper fret access! Both pickups will rock your socks off with all the sweet chimey vintage tone you could ever hope to get from an electric guitar, but the bridge pickup delivers the treble-enhanced power so often used in classic rock. The guitar really seems to shine in a clean or Fender-inspired amp but is no slouch in a hard-driven Marshal, either. All recordings in this section were recorded with an Olympus LS-10. The amp is an Axe-FX Ultra set to either the “Basic Brit 800” (Marshall JCM-800) or “Tiny Tweed” (Fender Champ) setting. The speaker is a QSC K12. All guitar knobs are on 10 for all recordings. I decided to record all of my Bluesbirds using the same methodology so that I could compare them in an upcoming article. I do three things: A chord progression, an open E chord, and a solo riff at the 12th fret. I do all three of these things on both the Marshall JCM-800 patch and on the Fender Champ patch. For each recording, I cycle through all four of the possible pickup combinations, those being (in order): neck pickup, both pickups (in phase), both pickups (out of phase), bridge pickup. Yes, this is repatative text if you’re reading all my Bluesbird reviews at once. Most people don’t do that. You should really get a hobby. In fact, so should I. Actually this is one of my many hobbies: spending too much money on guitars and writing about them when I have other work that I really should be doing. I chose these two amp settings because I like them and I think they give a good sampling of two very commonly used tones. This guitar is a great example of that because I thought I would prefer the powerful JCM-800 tones but the Champ is really what excites me when I play it. That is, until I feel the need to unleash the power and then it’s right back to something with serious gain. That’s one of the great things about this guitar: It seems to sound great no matter what amps, pedals, or patches you plug it into. Since I use an Axe-FX, it’s easy to try other things, and I found my self playing with Orange amps, Van Halen 5150 amps, Mesa Tripple-Recs, Fender Twins, Jazz amps, and everything in-between. This guitar is a joy to play because the action can be set super low without buzzing or fretting out. It reminds me a lot of my old S300A-D in that it plays very similarly, has ridiculously good sustain, and sounds great. 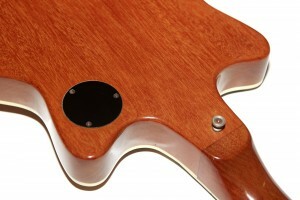 The upper fret access is amazingly good. I have owned high-end custom shop Jackson guitars that are designed for high fret access and this guitar beats all of them with the exception that the Jacksons are all neck-thru and have wonderfully low-profile neck heels. The neck attachment is at the 18th fret, but there is complete unfettered access all the way up to the 22nd fret. After spending a day playing one of my X-500 jazz guitars, this one feels like the neck is twice as long. The heel gets a bit thick up around #18, but you can play barre chords on the 17th fret provided your fingers are thin enough. It’s crazy. The relatively flat fretboard is something I personally like, but if you’re a lover of the 7.5″ radius on some vintage Strats, this guitar may not be for you. If you like ’em fast and flat, though, buckle up because this guitar delivers. The guitar is very body-heavy, and if you’re used to picking up guitars by the neck I would advise a fair bit of caution because the vast majority of the instrument’s weight is in the bottom fifth of the guitar. Finally, because the guitar is so thick and all the controls except for the pickup toggle are on the bottom, I found myself having to either tilt the guitar or look over the top of it to find the phase switch while standing. I’m sure that would get better over time, but it’s a stark difference to thinner guitars like an S-100 or my ’81 M-80. 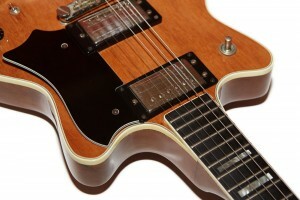 I’ll be honest and tell you that looking at the picture below, my first reaction is that this is a goofy looking guitar. 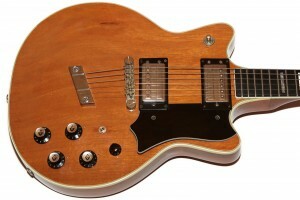 Sure, it’s not as goofy as, say, a Guild Thunderbird S-200, but it’s pretty odd none-the-less. Odd is in the eye of the beholder, though, and I can also tell you that after picking this guitar up and playing it for a bit all thoughts of its shape were lost while I marveled at the playability and tone. Having shown this guitar around a bit online, people always seem to comment on it. Maybe because it’s different, and maybe because it’s so clean, but either way it seems to garner attention. Bottom line: if you stumble across one in your travels, buy it, but make sure the binding is sound (or you’re willing to repair it) before you do. I’ve seen these sell for Les Paul Historic R8 money ($2000+) but I’ve also seen them sell for less than half that. It all depends on condition and if there’s someone competing with you that knows what great guitars they are. Hell, when I showed the pics of this one to a guitar forum I had three people PM me asking to be first in line if I sold it knowing that I often buy guitars just to write about them. This one is enticing, though. I might have to keep it. Hey Tom – thanks for the great story! They are truly exceptional guitars and I hope you still get many years of enjoyment from it! thanks a lot for all your efforts and your detailed expertise about these extraordinary pieces of stringed wood ! given the fact that the M-80’s were not produced and sold by the thousands … and taking into account all those great reviews elsewhere, in various guitar online-forums and gear-nerd-discussion-boards … I wonder … how come there are only SO FEW LIVE-vids to be found … where this fantastic guitar really shines on stage ?